Helping children develop a solid understanding of place value is so important, as place value concepts underpin fluency in arithmetic calculations and support ongoing learning with larger numbers and decimals. This fun place value game can be played at home to help reinforce concepts students are learning at school – all you need is a pack of cards! Number of players: Best played in pairs. 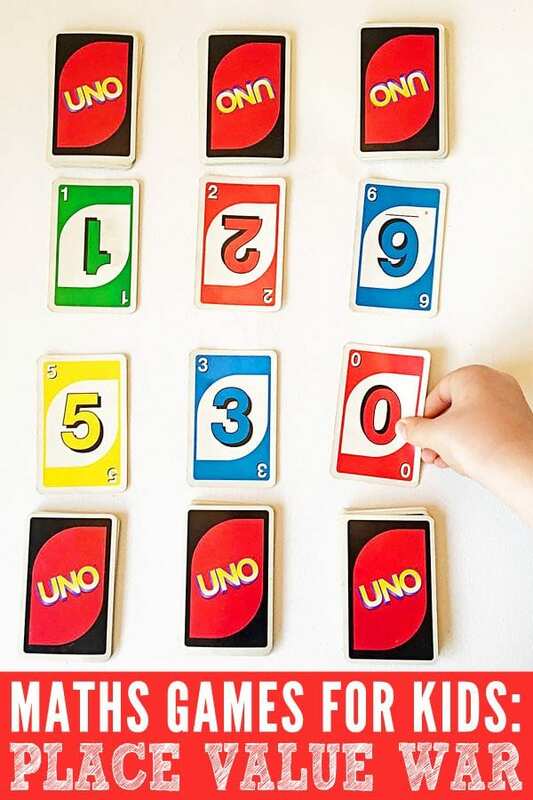 Equipment needed: A deck of Uno cards or playing cards per pair – you will just need the number cards so remove the action or picture cards before play. A second set of cards is helpful if you are playing with thousands, as you will move through the cards in one deck quickly. Deal the cards into two (for playing with tens), three (for playing with hundreds) or four (for playing with thousands) piles per player. To begin play, each player turns over the top card from each of their piles. The players must identify the number they have made by saying it out loud. The player with the number of highest value wins the skirmish, placing all of their own and their opponent’s cards into a prisoner pile. Repeat until all of the cards have been played. The player with the most cards in their prisoner pile is the winner. In each round, each player is allowed to re-arrange the cards they have turned over in that round to make the largest number they can. The player who can make the number of highest value wins the skirmish. Instead of capturing and counting prisoner cards, the winner of each skirmish scores one point, with the scores being recorded on a piece of paper. The first player to win an agreed number of rounds (say 10) is the winner. Parents can ask their child to identify which digit is in the ones, tens, hundreds or thousands place. Middle and upper primary students (Years 4-7) can play with whole numbers and tenths, hundredths and thousandths to help reinforce their understanding of decimal place value.